Wake up to the sound of birds and the fresh smell of the forest in Carmel's favorite family retreat. 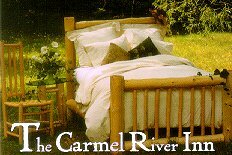 The Carmel River Inn is tucked along the riverbanks of the beautiful Carmel River. Spend cool summer nights. Awaken to the sound of the river, crisp blue skies, fresh ocean air. Enjoy a swim in our spacious heated pool. Visit the Monterey Bay Aquarium, Point Lobos, Carmel Mission & much, much more. There's plenty to see and do. Spend a quality family vacation in the River Inn's comfortable, affordable cottages. 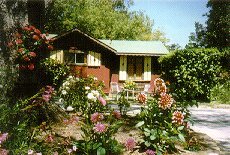 The Carmel River Inn features 19 rooms and 24 cottages, heated swimming pool, wood burning fireplaces, rustic log furniture, private decks, kitchenettes and coffee makers in every room and ample private parking. Pets Welcome. This and other Carmel Lodgings can be found here in The Register. Romantic Country Inns, Getaways and B&Bs offer a great California Coast lodging alternative to big hotels. A warm comfortable room can make for a great vacation or business travel day!